It comes from the Yarra Valley (duh!) - Little Yarra Wines. Now I haven't visited the cellar door so I can't tell you much about the experience but if the photo on the label is indicative of the location - then it's awesome and you should probably go there. Apparently (according to the back of the label) they have an emphasis on natural farming techniques also. Not sure what that entails but ok - awesome. They only make two wines right now - it's a relatively new winery - the Chardonnay I'm drinking and a Pinot Noir. It smells fresh. Kind of citrusy and orange blossoms after a rainy day, coming in to spring. Or something like that. I might be getting a little carried away as it's raining and on the cold side here today. But if I close my eyes and smell it - that's what it reminds me of. Love that smell! It's a young wine. It's 2014 so it's early days but that's not a problem. It's clean on the palate and a little tangy. It's got enough strength and acid that it would stand up well to a spicy dish - fingers crossed that that's what I'm having tonight. 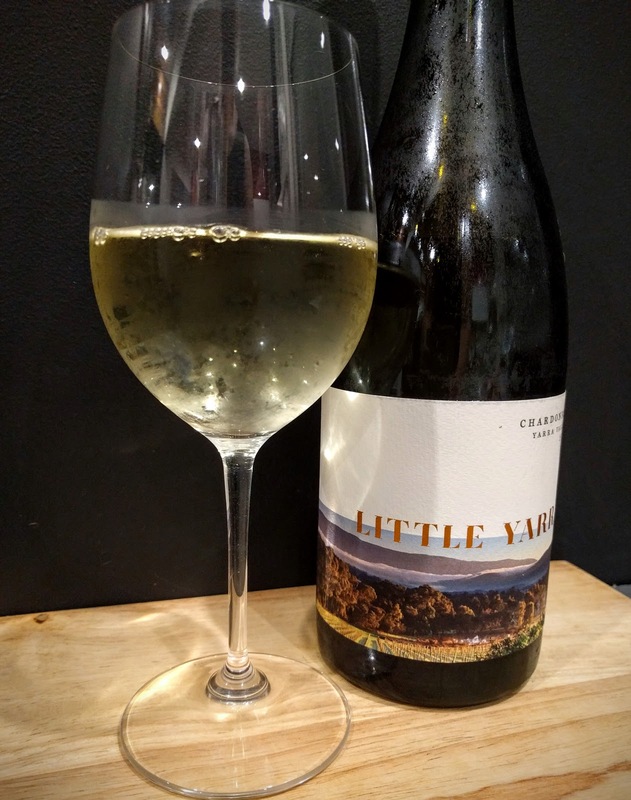 If you've got a new to wine drinker at the table this one could be a good one to give them - it's pretty accessible and a nice introduction to a young chardonnay. I can't remember what I paid for it but it's around $40 a bottle, but you can probably get a discount in a pack. Probably a little on the pricier side - but it's a nice drop and I'd drink it again very happily. In fact I'm going to go top up my glass a little now. Quintessa is in the heart of Nappa Valley, in Rutherford. It's a very pretty part of the world, not one I get to frequent often but I always enjoy it when I do. On this occasion it was purely luck that brought me to their vineyard for tasting and a visit. It was back in 2007 and I was with a colleague driving around Nappa. We saw the sign and just drove up. Typically they don't allow walk ins - you have to book in advance for a tasting experience. Very different to most Australian vineyards. We got lucky and were able to have a modified experience with just a tasting. Still nothing there is 'just a tasting'. It's a full on seated experience with decanted wines & cheeses. They really go all out to make it enjoyable. So what does that mean in real terms when it came to drinking it in 2015? Well it meant decanting for a while - a long while. On the nose it smelt a lot like plums and berries - more cherry than strawberry though. Lots of spice too. To drink it was pretty smooth. Lighter that I expected it to be. Thankfully we weren't pairing this with anything rich and gamey as I don't think it would have stood up to it enough. But with the rare roasted beef and salad we had it was pretty easy to drink. An unusual choice for us with the meal but we really wanted to drink something from the "fridge" and this was the pick. I don't get up to the Hunter Valley very often but when I do I take it as an opportunity to try some different cellar doors and wines that I usually drink. Last year I made it to David Hook Wines cellar door in Pokolbin. We tried a few wines and brought a few more back. 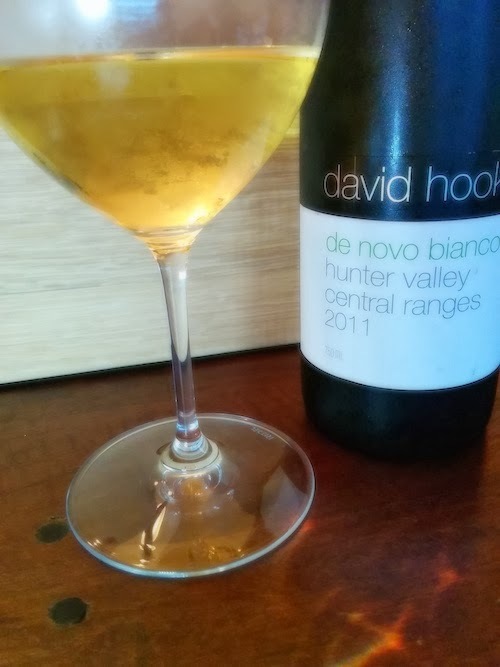 One of those is the de novo bianco 2011 which we just cracked open tonight to eat with our grilled barramundi. The de novo biano is a blend of 4 grapes - Pinot Gris, Sauvignon Blanc, Chardonnay and Riesling. The nose is very delicate - at least is was for me tonight - with just a few hints of orange blossom. The palate is light but more robust and rich than a Sauvignon Blanc. The taste is smooth, maybe a hint of apricot or similar stone fruit. A hint of spice, but nothing overwhelming and nothing too strong to overpower any food you're eating. All in all a good choice for our fish tonight. At around $30 a bottle it might not be you're every day quaffer but it's something to bring around to a friends for dinner. They won't likely have had it and it's a good all-rounder that's likely to please. In fact I'm off to grab another glass.